This was easy: pretty much anything written by Bill Bryson will have me chuckling to myself at some point. I originally picked up his books about travels in America about ten years ago and have gone on to read quite a few of his others, including the recent Shakespeare and Short History of Nearly Everything – which are actually nicely digestible, non-fiction books, which bring together a huge range of theories and ideas, but which don’t feel a chore to read. His travel writings are comprehensive, but with some great ‘personal’ touches: he examines small-town America in the wider abstract, but also goes back to visit family/friends who still inhabit that world, giving an added depth to the other side of his travels. His books also always have a nice touch of sarcasm (or realism) depending on how you look at life: “We used to build civilizations. Now we build shopping malls.” His writing is so descriptive and absorbing, you can feel like you’ve taken the road trip with him. At the same time, he has a fantastic klutzy, calamity aspect to him, that there will always be interesting escapades along the way, or original images that have you laughing out loud. 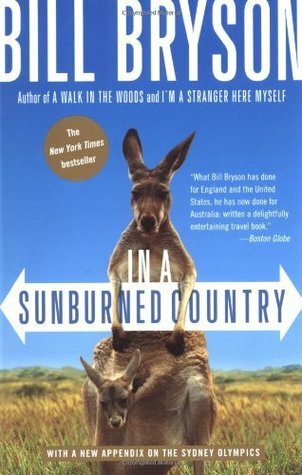 My favourite travel books of his are the American ones; although the Australian trip I think was the funniest – he just sees things in such a straight-forward way that the humour is dead on. 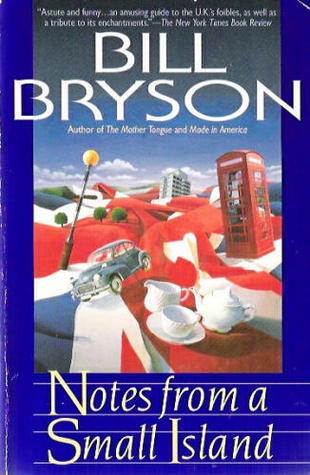 This entry was posted in General and tagged 30-day challenge, bill bryson, books that make you laugh, informative, reading for enjoyment, travel books on March 17, 2014 by mel. I recommend “Notes from a Small Island” for anyone visiting the UK before they get here. Bryson has nailed what a strange people the British are! I have “The Thunderbolt Kid” sitting on my desk, three books down my TBR, and all of the books you mentioned above on my bookshelf. Great to dip into. Bryson is like a ditzy and lovable uncle. Have you read “A Walk in the Woods”?